Hey, everyone! I’ve got a couple of Halloween Recipes for you this week. If you are in need of some festive treats then check out this yummy recipe and come back tomorrow for another! You know those yummy cookie pizzas that are in the food court at the mall? Well, that’s what I’ve got for you today. 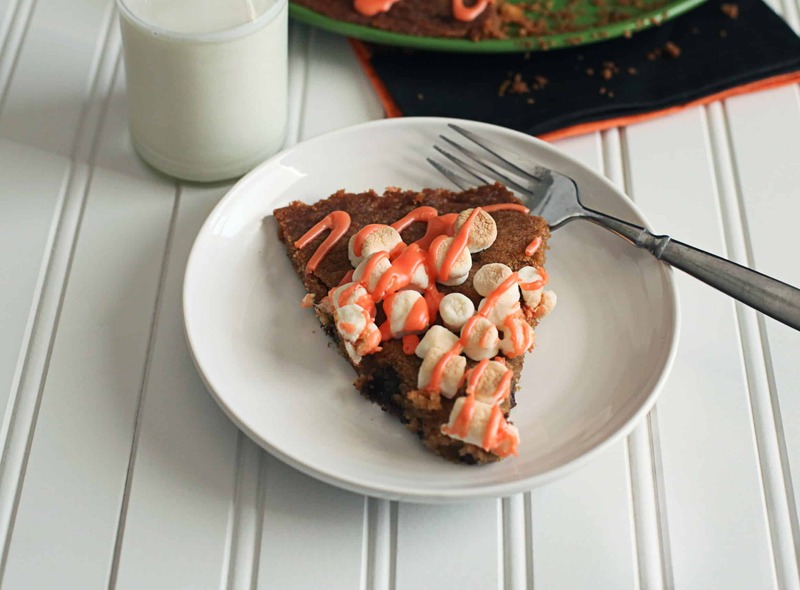 This yummy Halloween Cookie Pizza will be a hit at your next get together or even the break table at work. 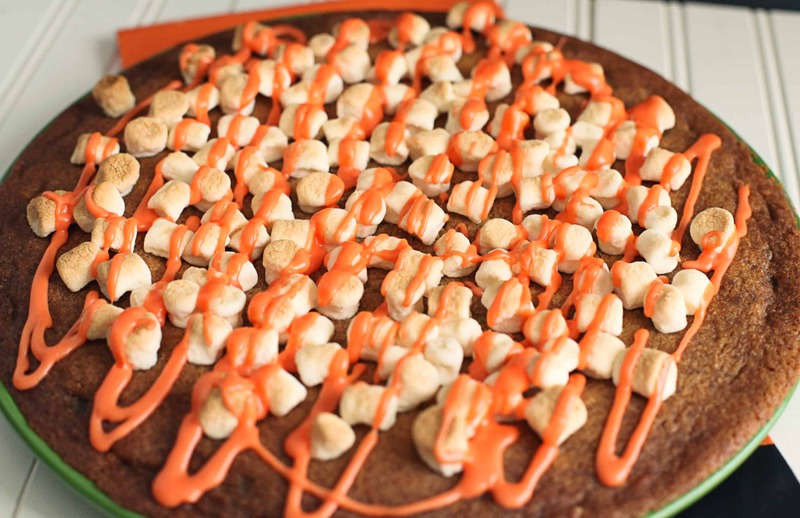 I hope you enjoy this yummy cookie pizza. It is sure to curb your next sweet tooth. Now, I would love to know what your plans are for Halloween. Do you dress up and take your kids trick or treating? Pass out candy? Curl up on the couch with your favorite movie and some yummy treats? Just leave a comment in the comments section. Come back tomorrow for another Halloween treat! In a seperate bowl, stir together flour, baking soda and salt; add to sugar mixture, beating on low speed until blended. Stir in chocolate chips. Spread batter in prepared pan and leave a 1/2'' of the edge. Bake 11 to 13 min or until set. Remove from oven. Sprinkle with marshmallows and return to oven. Bake 5 to 7 minutes or until marshmallows are lightyly browned. Cool completely. Drizzle colored icing on top. Spread dough over pizza pan but leave a 1/2 inch around the edge because the dough will expand while baking. Mix all ingredients together until a runny consistency is achieved. Add more powdered sugar and/or water if needed. Drizzle over pizza once it has cooled. Allow icing to dry before cutting. Approximately one hour. 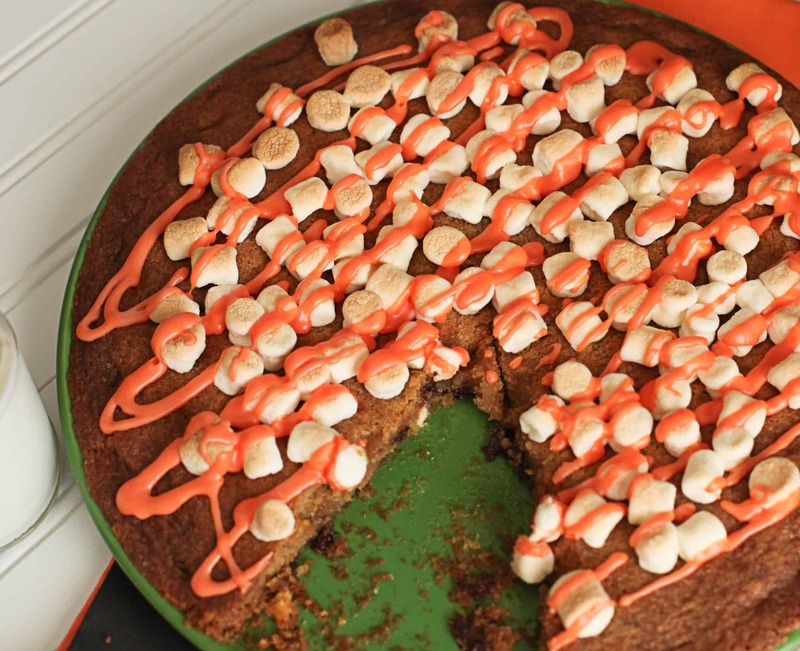 More or less of the food coloring can be used until you are pleased with the orange color.